Bali, September 11, 2013 – As one of the leading hotel operators in Indonesia with a portfolio of more than 60 hotels throughout Indonesia, the Philippines and Malaysia, it may come as no surprise that Archipelago International is reaching the final development stages of an iconic MICE hotel at one of Bali's most sought-after addresses. 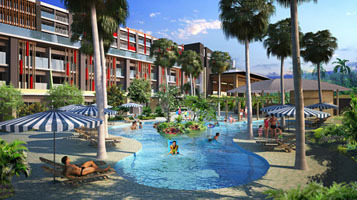 Boasting a successful history of meeting the increased demand for business, international and leisure travel, Archipelago International has once again seized an opportunity for a quality hotel development in Bali, this time at the tropical tourist enclave of Jimbaran, just 15 minutes south of the Ngurah Rai airport. Aston Jimbaran Hotel will be located on a hilltop above Bali's famed Jimbaran fishing village with unobstructed views of Jimbaran Bay and the spiritual Mount Agung. The hotel will host 268 guest rooms, 8 meeting rooms, and a grand ballroom that can accommodate up to 1750 guests. With so many convenient amenities in a picturesque location, the upscale hotel is set to attract savvy business travellers, as well as the discerning leisure traveller looking for a classy getaway at the centre of Bali's tourism district. "We are confident that Aston Jimbaran Hotel will be an icon of Jimbaran’s most comprehensive and consistent upscale hotel network, bringing with it unrivalled international standards and sophisticated conference facilities; a perfect match for business and leisure travellers. By the end of this year, this hotel will be ready to accommodate any MICE and holiday requirements." says Norbert Vas, Vice President of Sales & Marketing Archipelago International. The development of the hotel itself has reached 60%, with a completion date expected to be the end of this year. Archipelago managed Hotels operate under the hotel brands Grand Aston, Aston, Aston City, Alana, Harper, Quest, favehotels, NEO and Kamuela ranging from ultra-luxurious private pool villas to serviced apartments and select service economy class hotels, thus offering Indonesia’s vastest and most comprehensive hotel network.